Miami Beach 411 : Restaurants : Emeril's : Creole Restaurant at the Loews Hotel in South Beach, FL. Call 305.695.4550. Emeril's at the Loews Hotel. This page allows you to find Menus, Customer Reviews and Online Reservations for Flirt Sushi in Miami Beach. 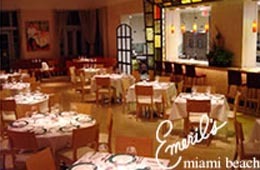 Emeril's is located at 1601 Collins Ave. in Miami Beach FL, 33139. Nearby restaurants include: Jerry's Famous Deli, Osteria del Teatro, and Preston's. Use our Miami restaurant map to find the exact location. Emeril's "Service a Plus Food could have been better"
Service was amazing, couldn't get better. Food, SUCKED. Emeril's ""Bam???" More Like "BLAH !!!" Unfortunately our dinner was Blah. I cannot believe we spent $300 on 4 courses of bland food, ... and were "talked down to" the entire evening. First and foremost, the appropriate manner to handle the wine service, is to ASK who at the table would like to see the wine list. It is no longer proper etiquette to assume the gentleman will be ordering, ... period. On the food, it was very disappointing, ... especially for Emeril fans !!! 1. the cheese cake was like eating a packet of Philadelphia Creme Cheese, with chopped peppers 2. the gumbo had zero taste. It was a waste of calories !!!! 3. the andouille sausage was tasty, but the accompaniment was raw and had a funky/musty flavor. 5. service just OK. The waiter was condescending and assumed that our price range of $100 per bottle of wine was something less than the norm. Unfortunately, for Emeril fans, we have no interest in returning to this or any other of his restaurants. Emeril's "Great Food! Great Service!!!" I have got to be Emeril's #1 fan!! I watch him every night! And day whichever comes first! Our family reunion was in Orlando last year and we went to BOTH restaurants! We celebrated our wedding anniversary at Chop Chop! Food Great! Service great! We will be in Miami for a cruise for this year's reunion and YEP! 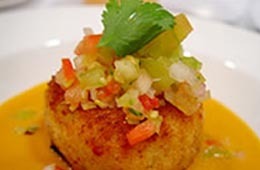 we will be there on South Beach eating at Emeril's on the 16th! Emeril's "Still remember - one year later!" Absolutely loved Emeril's at Loews Hotel in South Beach! I thought about the calamari appetizer many times over the past year! I can't wait to go back when we are in South Beach again in a couple of weeks! We recently visited So. Beach and ate at Emeril's restaurant. The service was divine, the food wonderful. First class all the way. The place was noisy but we don't mind that at all, some do. Our experience was awesome!! Emeril's "the best of the best"
The most wonderful dining experience.The servers were so attentive but the food was most memorable. Everyone should try the calamari..the smoked tomato sauce was a blast..the fish even better..but the banana cream pie. Emeril's "Best in South Florida"
Best in South Florida - Emeril's? Well, yes, but I am really referring to the wait staff, especially a great young man: Andrew Ahr. Food plus service: what a great deal! Emeril's "Loved everything about this restaurant"
This was the most wonderful dining experience my wife and i have ever had. Your staff must be all hand picked because they take care of every detail. We can still taste the wonderful flavors of the food. My wife spoke to Andy Garcia briefly. I guess we came at the right time. Thank you for a great time. Excellent food, suburb service and a divine atmosphere. Use this eform to submit a reservation inquiry to Emeril's. For immediate assistance, call the restaurant directly at (305) 695-4550. When calling, please mention that you found them on MiamiBeach411. For questions about booking tables, read our reservation guidelines. Emeril's in Miami Beach's Dining Guide.